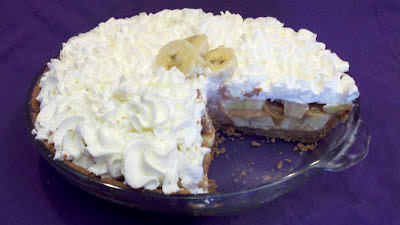 I first heard of Banoffee Pie on a cooking show that highlighted decadent desserts from different restaurants. Of course, it looked so good that I needed to get the recipe. Little did I know how popular the dish has been for decades! I had no idea that this was a classic British "pudding"! Credit for the pie's invention is claimed by Ian Dowding (chef) and Nigel Mackenzie (owner) at The Hungry Monk restaurant (now closed) in Jevington, East Sussex. They developed the dessert in 1972, having been inspired by an American dish known as "Blum's Coffee Toffee Pie", which consisted of smooth toffee topped with coffee-flavoured whipped cream. Dowding adapted the recipe to instead use the type of soft caramel toffee created by boiling a can of condensed milk and worked with Mackenzie to add a layer of bananas. They called the dish "Banoffi" and it was an immediate success, proving so popular with their customers that they "couldn't take it off" the menu. And there you have it. Actually, I do remember seeing this method on a cooking show many years ago called Two Hot Tamales, and they did the same thing with the cans of sweetened condensed milk. I never thought of making a pie with it, though. I just used it as a caramel sauce for ice cream (which is FABULOUS, btw). So, I've listed two versions of the pie. The first is from Nigella Lawson, and is the classic British version (as least, as far as I can tell). It uses Digestive Biscuits, which are kind of like graham crackers. The second is from Paula Deen. It's slightly different, but it's still the same idea. Paula's method of caramelizing the milk is different, but is ready in half the time, and it also eliminates the worry of exploding cans! Melt butter and add crushed biscuits, spread on bottom of tin & chill. boil the tins of condensed milk for 2-2.5 hours. BE SURE THAT THE TINS ARE SUBMERGED IN WATER AT ALL TIMES - OR ELSE YOU WILL BE CLEANING THE CEILING!!! When cool spread the toffee over the biscuit base. slice up a couple of ripe bananas on top of toffee whip up the cream and spread over the banana. Grate some chocolate or even chocolate curls, or drizzle melted chocolate over the top chill (or serve straight away) and serve to very happy people! -BIG TIP- one can boil up a load of tins of condensed milk. Once they are cooked they will keep very safely for months in the larder or cupboard. Just keep an eye on water levels. This makes it the fastest dessert in town if one has the toffee already. Also the biscuit base mix freezes very well. Mix graham cracker crumbs with softened butter and press mixture into 9" pie plate. Bake for 5-8 minutes at 350. To create toffee filling, caramelize the sweetened condensed milk. Pour the condensed milk into a 9x12x2 glass-baking dish. Cover with foil and place dish inside a larger poaching pan. Add water to poaching pan until half way up sides of baking dish. Bake at 300 for an hour and a half. Once both the crust and toffee filling are cooled, spread half of evenly inside crust. Slice the bananas and layer on top of filling. Pour remaining half of filling over bananas, spreading evenly. Whip the cream with the confectioners sugar and vanilla and spread on top of toffee filling and bananas. *You clearly don't have to remove the label from the cans before you boil them, but if you don't, the glue will melt and get all over the inside of your pot, which is kind of a pain to clean. It's easier just to remove the label in the first place. Then again, if you use Paula's method, you don't have to worry about that at all! -For the crust, I used 2 cups of graham cracker crumbs (2/3 of a box) + 8 tbs melted butter. I found Paula's crust recipe to be a little too much butter and not enough crumbs. -I prefer the graham crackers over the digestives because I find them to have a slightly different, more crispy texture. Just sayin! -Use a second pie plate to press the crumbs into the first pie plate for an even crust. -Digestive Biscuits are so named because of the belief that they had antacid properties due to the use of sodium bicarbonate when they were first developed.